Doki Doki Literature Club, a dating sim that's more than meets the eye by Team Salvato, has just surpassed one million downloads since its September release. To celebrate, the game's creator Dan Salvato took to the studio's official blog to thank the game's fans, and give some insight on what's to come. "It’s only just now I’ve realized that nothing I’ve ever done in my life has had greater reach and popularity than a romance game with cute anime girls," wrote Salvato. 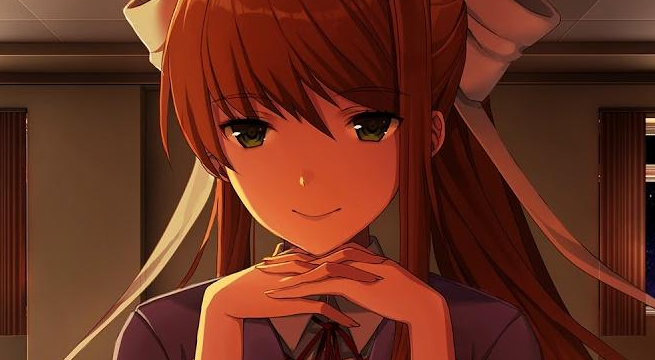 "I owe this post to all of the amazing people who took the time to put DDLC in the spotlight, allowing it to reach these heights of which I never thought even one tenth would be possible." Salvato named several publications, along with popular streamers like Jesse Cox, CinnamonToastKen, the Game Grumps, and Pewdiepie when describing the people who helped the game gain its now vast popularity, attracting players from outside of the visual novel genre. Salvato went on to thank the game's several fans, who often shared their experiences with friends on social media, and supported the game with good ratings. "Here on my end, I’m doing my best to keep up with everything business- and development-related so that I can give the community more of what they want," Salvato said. "It’s all very new and strange to me, so I’m still growing into it, and I greatly appreciate all the support everyone has given me these past couple months." As for the future, Salvato doesn't have solid plans yet. "While I don’t have anything to announce right now, I’m considering some options for providing more DDLC-related content to fans in the future," he wrote, mentioning that he was in the process of working on his next game already. Doki Doki Literature Club is free to play and available to download via Steam.